Whistleblower Edward Snowden has officially come out of the shadows and joined Twitter using the handle @Snowden, which was verified within two hours of joining. A quick search shows that the handle was previously owned by another user, but it had been left unused for quite some time so Snowden presumably acquired it on that basis. Snowden’s first tweet was a quip giving a nod to his background as a former CIA employee and US government contractor before he leaked classified information from the National Security Agency in 2013. Snowden’s account has amassed almost 300,000 followers in just a few hours; he is following just one account though – @NSAGov – which has not officially followed him back. Hiding out in Russia since 2013, his asylum is quickly running out so he is reportedly hitting up other countries while he’s still wanted in the US on charges of espionage. 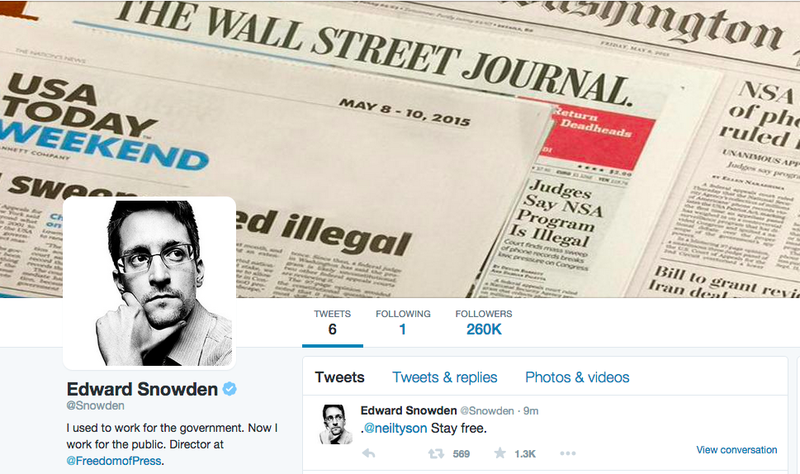 Snowden’s only interactions on Twitter have been with cosmologist Neil deGrasse Tyson so far. Ed @Snowden, If you visit Mars, I'd bet any life forms there will greet you with a sip of that water — and a tourist visa. Clearly enjoying his time in the limelight, Snowden also found time to throw some more shade. His choice of background is interesting as well – newspapers dictating the very leaked information that has since dictated his life. It will be interesting to see if there’s a reason for his timing or if Snowden is just bored of the low profile life in Moscow as a fugitive. Either way, he is making sure his former colleagues at the National Security Agency know he’s around.